Since I’m obsessed with my Instant Pot, I’ve decided to feature all the recipes I have created since I’ve bought my Instant Pot. I’m not a food blogger but I’m the next best thing – a novice cook who has upped her game now that she can pressure cook anything and everything and it tastes like it came from a restaurant! Pour contents into blender and press puree. Pour soup back into Instant Pot and keep warm. 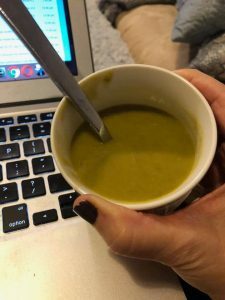 Since I have been on an Instant Pot marathon, today my hubby texted me with a simple request: I would like you to make me Split Pea soup before I come home from work tonight. 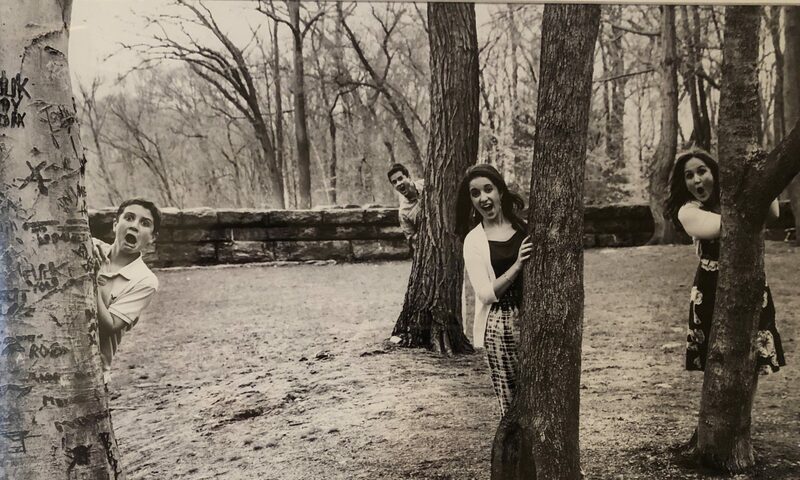 Of course, feminist that I am, I should have told him to buy himself a cup of soup and call it a day, but the 1950’s Stepford Wife in me decided to head over to Balducci’s and pick up all the ingredients. Press saute button and add olive oil, onions, peas, carrots, thyme, vegetable broth and water. Pour contents back into the Instant Pot. Put the eggs on the insertable shelf that comes with your Instant Pot. Put on the cover and lock it. Make sure that air is not released. Cook on high pressure, 11 minutes. Place the spaghetti squash on the tray inside the pot. Once it’s done, remove the skin, scoop out the seeds and use a fork to turn it into spaghetti squash strands. Close lid and cook on high pressure for 10 minutes. You can cook the linguini and pasta sauce on your stove top while you are making the meatballs. However, you should know that it’s just as easy to cook pasta in the Instant Pot as well(10 minutes on high pressure with water). I’ll have more recipes for pasta soon but just want you to know it’s easy to do that too. 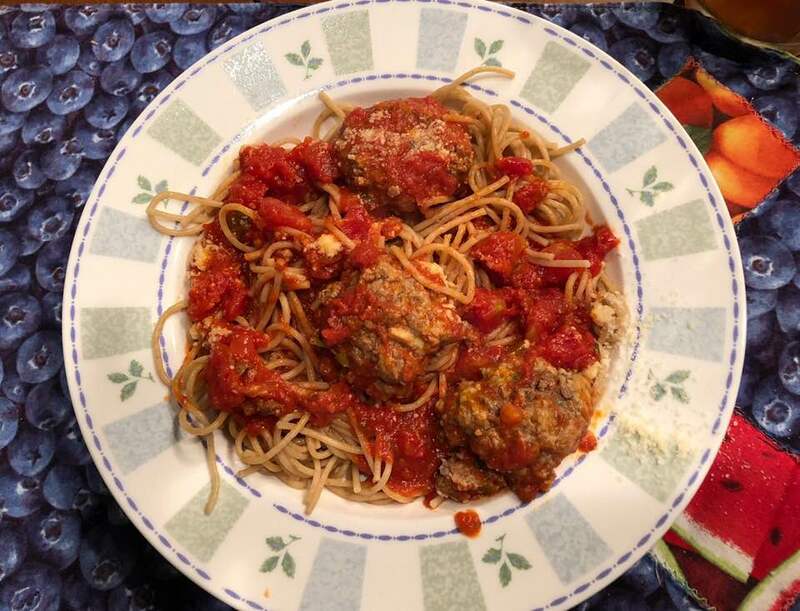 Once the meatballs have finished cooking, you can add them to your tomato sauce that’s cooking on the stove. Once the linguine is done, dinner is served! I have been avoiding my scale like the plague the last few months. Even though I’ve been exercising about five times a week, I decided that I didn’t have to hop on the scale and get depressed. I would know whether I was putting on weight if my jeans were tight rather than staring at a number that put me in a foul mood. Well, I hate to admit it, but I was dead wrong. It seems like every year I decide to do some wacky diet where I lose some weight and then inevitably fall off the wagon, gain it back and then add a few more pounds to make things that much more painful. Add in the fact that I’m approaching menopause and you’ve got a weight tsunami on your hands. This week, I knew I was going to have to hop on a scale because I had an annual exam scheduled at my OB/GYN’s office so I decided to rip the Band Aid off and weigh myself at home. I’m so sad to admit this, but I am heavier than I have ever been in my life. I won’t count the day they weighed me when I was in labor with my son because that number is seared in my brain but I think I will lock myself in my walk in closet and never come out if I hit that weight again. The fact is, while I’m not at the highest number I have ever weighed, I don’t have an eight pound newborn growing inside of me along with a few gallons of amniotic fluid so I guess I have no excuses whatsoever about how I got here. While I can always blame the entire year on the presidential election, at this point, that’s the same excuse as blaming it on trying to lose the baby weight. After a certain point, the only person you have to blame is yourself. I am guilty of eating bread from the bread basket at restaurants. I am guilty of drinking 2-3 glasses of wine every weekend. 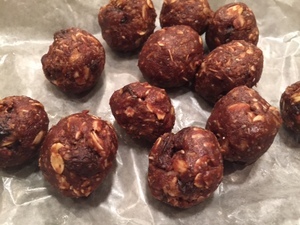 I am guilty of grabbing a few post Halloween treats from my pantry (mini Snickers and Twizzlers to be exact). I am guilty of inhaling a KIND bar on my evening commute. I am guilty of eating a much larger portion size at dinner. I am guilty of eating way too much pasta. I am guilty of eating french fries and sweet potato fries. I am guilty of eating potato chips. I am guilty of eating Ben & Jerry’s Chocolate Chip Cookie Dough ice cream. I could probably go on for days with all my food confessions but I don’t have time for that anymore. Instead, I have decided to cook myself thin and I’m taking my husband with me. After reading about a woman who lost over 100 pounds by cooking food in her Instant Pot, I have become a woman on a mission. This past week, I have cooked four meals in a row in my electric pressure cooker and I’m even going to whip something up tonight — Friday night — before my husband and I go out to a movie and sneak in some low calorie popcorn. So far, my hubby has lost 4.5 pounds on our Instant Pot plan. I’m down a pound so if I keep this going for 52 weeks, I could be down at least 50 pounds by then. Okay – I don’t have that much to lose but I definitely want to drop at least 25 for now and then we’ll see where it goes after I hit my first goal. I know that on Role Mommy I make a lot of promises and share a lot of my hopes and dreams with you. I’ve also shared a ton of my weight loss struggles. You’ve seen me lose and gain over the last decade a lot and this time around, I’m tired of the shakes, the bars, the plan, the Keto, the Whole 30, the prepared meals, even Weight Watchers. I’m all in on the cook myself thin with my Instant Pot plan and will keep you posted on how I do. I don’t really want to post a before pic just yet since I’m letting that horrifying number on the scale still sink in but I promise to share an after every time I drop 10 pounds. For now, my OB/GYN told me to download an app called Fat Secret (in the app store it’s called Calorie Counter by Fat Secret). In a nutshell, it’s a food diary where you record everything you eat in one day. Once you share how much weight you’d like to lose, it calculates how many calories, macros and nutrients you should have in one day. You can even eat out and select options from the app, they offer recipes and you can even take a snapshot of your food and it will record it into the system. So there you have it. No more gimmicks. No more get thin quick schemes. No more paying people to weigh me. I’m losing weight on my own terms and this time, I really mean it. I’ll check in next week and let you know how I’m doing. 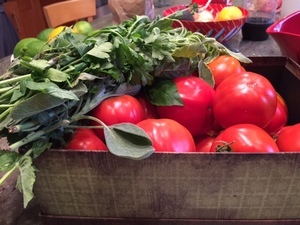 We are deep into tomato season and I am looking for ways to use up my tomatoes other than raw tomato salads. Using flavorful chicken sausages is a great way to add flavor and texture to your tomatoes. Enjoy! In a medium sized frying pan over a low flame, heat up the oil. Add in chopped sausage and saute until browned. Remove from pan and place on a plate nearby. Add in the prepared garlic o the pan and saute a few minutes, cautious not to let get too brown. Add in the chopped tomato and saute a few minutes. Add the sausage back in and stir so all the ingredients are combined. Add in the smoked , paprika and salt and stir. For more great recipes by Alma Schneider, visit her at Take Back the Kitchen. I just spent a week in Seville, Spain and spent a good deal of that week at my friend Antonio’s bar. He made the best Spinach with Chick Peas or Espinacas con Garbanzos. 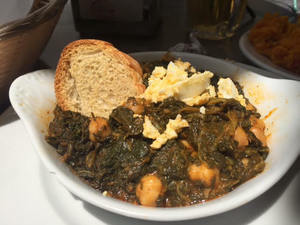 Although I have eaten this dish every time I have visited Seville, I never thought to make it. Until now. It doesn’t compare to Antonio’s but it is still pretty darn delicious. I combined a bunch of recipes I found online and ended up with this tasty version. Enjoy! In a medium sized frying pan, heat up two tbsp olive oil. When hot and starting to smoke, add in the spinach and stir until fully coated with the oil. Remove the spinach from the pan. In the same pan wiped out with a paper towel, add in 1 tbsp of the olive oil and let it heat up again. Add in the minced garlic and onions and saute for a few minutes until wilted. Remove the garlic and onions and puree in a food processor with the almonds, vinegar and the tomato sauce. \When it is pureed, add it to the pan again with the cooked spinach and mix until all the ingredients are combined. Add in the cumin, paprika and salt and stir. Add in the chick peas and stir gently so all the ingredients are combined. Stir in the remaining olive oil. Adjust seasonings to your liking and serve hot. For more of Alma Schneider’s amazing recipes, visit www.TakeBacktheKitchen.net. Summer is coming which means dips galore at BBQs! 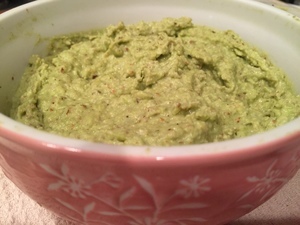 This is a recipe for a simple and healthy green pea guacamole that a friend gave me years ago. I just rediscovered it and thought I would share with all of you. Enjoy! Just put it all into the food processor and blend until smooth. We are in the throes of a frigid winter and what is more comforting than a nice steamy, bowl of soup? Better yet, a nice steamy bowl of Thai curry soup? 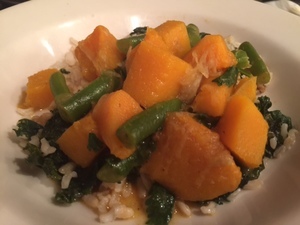 Here’s a simple recipe to use up your already cooked butternut squash. Freeze the leftovers for a nice treat later this winter as well. Enjoy! In a soup pot, add the coconut milk, the water and the curry paste, starting with only 1/2 tbsp (you can add more if you want it spicier later). Stir until all ingredients are well combined and boil until the sauce reduces a bit and is thickened to your liking, about 15 minutes. Add in the fish sauce, the honey and stir. Add in the green beans and cook until tender, about 10 more minutes. Add in the squash so it is heated through, about 5 minutes but not much more so that it doesn’t become too mushy. 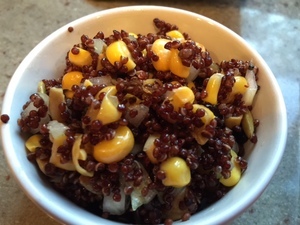 Remove from heat, adjust sweetness and spiciness and serve over rice, quinoa or by itself. Top with the chopped cilantro.